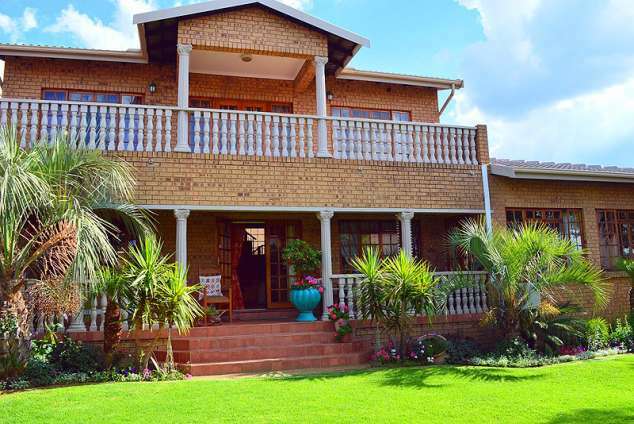 Kairos Home - Middelburg, Mpumalanga Accommodation. Kairos Home in Middelburg Mpumalanga offers 4 Star Self Catering apartments, situated in a tranquil environment with very little traffic. We are easily accessible from the main roads including the N4 highway and are close to Middelburg Mall with restaurants and shopping facilities. We have a seasonal outdoor swimming pool with a sun deck and deck chairs for complete relaxation, as well as a South African traditional thatched barbeque area (called a lapa) which provide an ideal dining experience and a relaxing lounge area . We have a meticulous garden and a peaceful marsh and dam nearby and is ideal for a short hiking excursion. Unit 1 is a 2 bedroom ground floor self catering unit with a double bed and 2 x three-quarter beds. We also have a sleeper-couch in the lounge which should be sufficient for 4 - 6 guests. The unit is completely furnished with a full kitchen including a washing machine, stove and oven, a dining room, lounge / TV room, flat screen TV, Dstv - Full bouquet, full bathroom with bath & shower. The unit has it's own entrance and is private. Unit 2 is a 2 bedroom ground floor self catering unit with a double bed and 2 x three-quarter beds. We also have a sleeper-couch in the lounge which should be sufficient for 4 - 6 guests. The unit is completely furnished with a full kitchen including a stove and oven, a dining room, lounge / TV room, flat screen TV, Dstv - Hotel bouquet, a fireplace, full bathroom with bath & shower. The unit has it's own entrance and is private. Unit 3 is a 2 bedroom self catering unit with a balcony with 2 x three-quarter beds and 2 x twin beds. Upon request we can accomodate an extra three-quarter bed for 1 additional person which should be sufficient for 4 - 5 guests. The unit is completely furnished with a full kitchen including a stove, a dining room, lounge / TV room, flat screen TV, Dstv - Hotel bouquet, full bathroom with bath & shower. The unit has it's own entrance and is private. Unit 4 is a 3 bedroom self catering unit with a balcony with a queen size bed, a double bed and a three-quarter bed. It is a completely furnished unit with a kitchenette with a microwave, toaster, kettle and small fridge, lounge / TV room, flat screen TV, Dstv - Hotel bouquet, full bathroom with bath & shower. The unit's entrance is in the main house and is private. Laundry at an additional cost. Detail description : We offer free concierge service, a 24 hour front desk and can prepare delicious meals if booked in advance. Health spa services can be arranged but require prior booking. We are ideally close to all the main industries, mines and power stations in the area to facilitate a peaceful environment for the business traveller. Extended stays are available on request at reduced rates. Kairos Home offers a conference and meeting venue that is ideal for gatherings. We offer a variety of package options with all related equipment to ensure a successful and productive outcome. We will happily customise a package for your specific requirements, including meal plans, accomodation and conference equipment. We are your hosts Johan and Dawine Verster and are very friendly, passionate and peaceful people who would like their guests to experience the tranquility and relaxation opportunities that the Kairos Home environment provides. We are actively involved in the day-to-day running of the business. With our hands-on approach we strive to ensure a high level of service and hospitality. We welcome you with open arms to your home away from home. 8091 page views since 04 Mar, 2013. Last updated on 19 Apr, 2018.